How often do you truly explore your own neighborhood or a community nearby? How often do you take a Walk with family or friends? How often do you sit on your porch and say “hi” to passersby? Ted Killmer, a Danbury Downtown resident and international arts enthusiast with a sense of curiosity, creativity, and community, is guiding a celebration of ‘Play’ on Saturday, March 25th, 11:00am to 1:00pm, throughout CityCenter’s Main Street business district. He invites you to join him for a cellphone-less Walk and Talk. Perhaps you’ll discover a hidden gem you didn’t know about, renew an acquaintance with a favorite place, or make new friends. For sure, there will be surprises. And perhaps the DisH will become habit-forming. “By Walking downtown environments, they become inspiring and significant parts of an impactful, international movement that cherishes place making, from Iceland to Belgium to South Africa to Argentina. The intention of ‘coming together’ as curious, creative members of a worldwide community as urban and arts enthusiasts is of enormous import”, notes Ted. He has recently conceived DisH Liv(ing) (“Downtown is Happening”) as an outlet for his Walking endeavors, each of which will be announced throughout the year. There will be eight Walks in all, supported in part by the Cultural Alliance of Western Connecticut in partnership with the Connecticut Department of Economic and Community Development, Office of the Arts, and the National Endowment for the Arts. In addition, the Walks also receive support by the Danbury Cultural Commission, CityCenter Danbury and the more-than-generous participation of eateries, shops, businesses, and individuals who make Danbury home. 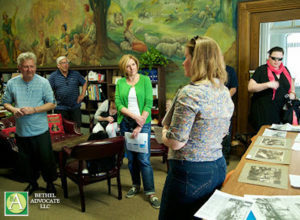 The March 25th Walk, promising hidden treasures, historic notes, tasty treats, and friendly chat, will include a soon-to-be-trending coffee and wine cafe on Main Street, a 1930s storybook mural hidden away, another in a parking lot behind one of Main Street’s most imposing buildings, a visit to the world of Tiffany, a photo op with a “Hat City” hatter, a look at a 3D printer and how it made Luke’s Toy Factory a success, a surprise shopping spree, and a reception with Vermont-artist Stefania Urist at the Cultural Alliance of Western Connecticut’s @287 Gallery. “It’s the DisH,” says Ted Killmer, “Downtown is Happening! Oh, and wear comfortable shoes, bring your camera, and a tote bag”.